Namibia began life as German West Africa, part of the German Empire. As such, one of the earliest flags to fly over the territory was the German black, white, and red tricolour. However, during WWI, British South Africa invaded Namibia, and took control. Once the war was over, the League of Nations awarded South Africa a mandate to govern Namibia. 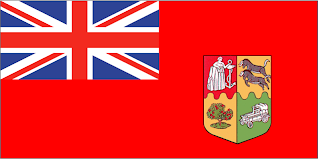 Thus, Namibia went first to the British Union Jack, then quickly on to South Africa's Red Ensign flag. May 31, 1928, saw Namibia be treated as part of South Africa's territory, and South Africa introduced a new flag. The Prinsevlag was raised. The Prinsevlag was a horizontal tricolour of orange, white, and blue. In the centre, are 3 flags together representing South Africa's history. 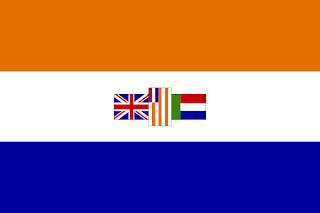 The Union Flag, the Orange Free State flag, and the Transvaal Vierkleur flag. After WWII, the League of Nations replacement, the United Nations wanted to turn Namibia into a UN trusteeship, only for South Africa to refuse. With South Africa's independence from Britain, there was a move to formally incorporate Namibia into South Africa. Whilst this never happened, Namibia was a de facto 5th province, and even had South Africa's Apartheid government placed on Namibia. In 1966, The South West Africa People's Organisation (SWAPO) began its armed struggle to win independence from South Africa. They where joined in their struggle by the Democratic Turnhalle Alliance (DTA). Independence was finally won by 1989, however, independence was formally declared March 21, 1990. 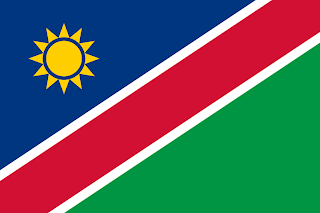 Upon independence, Namibia hoisted a new flag. Combining the colours of SWAPO (blue, red, and green) with the colours of the DTA (red, white, and blue). The flag itself features a red stripe rising from the lower hoist, to the upper fly. The stripe is bordered by 2 thin white stripes. Above the red stripe, the flag is blue, and below, green. In the upper hoist canton, a yellow 12 pointed sun. The sun represents life and energy, the red represents the heroism of the people, the blue represents the sky, and Atlantic ocean, the green represents vegetation and the nations natural resources, and the white represents peace and unity.